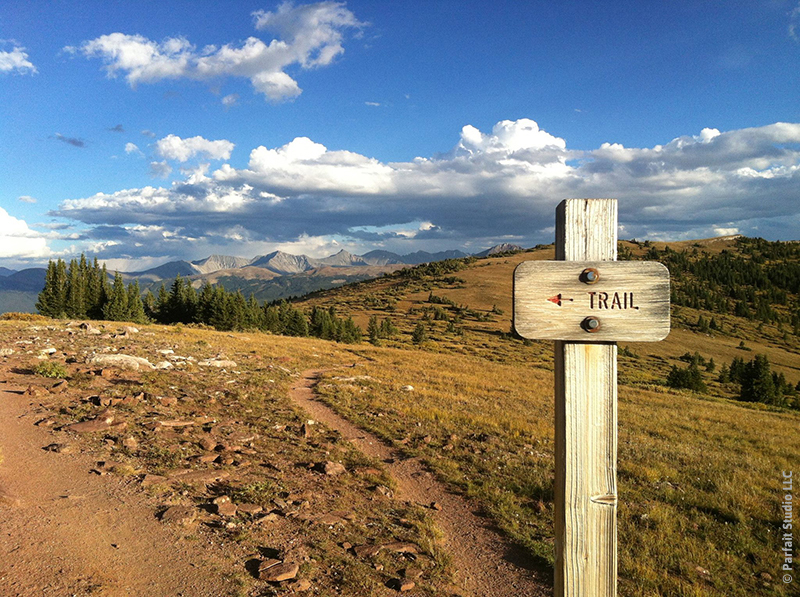 Trekking across the gorgeous foothills of Colorado is awe-inspiring indeed…but not always feasible. Hiking makes me happy. The sight of a single-track trail, filled with mysterious twists and turns is enough to send me scrambling for my Tevas. Since I live and work in the city, I don’t have the luxury of trekking down a mountain path anytime the mood strikes, so I opt for the next best thing: urban walking. Walking occupies a special place in my heart and mind…literally. We all know that exercise strengthens heart muscle and increases brain cell production, but recent studies show that strolling in nature also quiets the part of the brain that broods on negative thoughts. Something as simple as walking outside gives our gray matter the chance it needs to process the bad stuff and focus on the good. But, of course, anyone who regularly hits the trail can tell you this is true. ~ Aim for a minimum of 30-60 minutes, ideally before starting your workday and/or around lunchtime. This will give your brain a break and encourage those creative juices to let loose. Even a 10-20 minute walk is worth taking, so “I don’t have the time” isn’t a valid excuse! ~ Vary the scenery. Parks, open spaces, urban nature preserves — my favorite is Bluff Lake Nature Center in Denver — and tree-lined residential neighborhoods offer a retreat from the bustle and buzz of everyday indoor life. Some studies have shown that walking next to heavy traffic for long stretches can actually increase stress, so avoid busy streets whenever possible. ~ Don’t let the weather stop you! Unless there’s a major storm blowing through, take a page from the proverbial mail carrier, and walk through all sorts of weather to get your fix. On winter days, I pull on lots of layers and and slip Yaktrax traction cleats over my boots to give me extra stability on icy pathways. We tend to hibernate indoors during the colder months, but daily outings highlight the changing seasons and remind us that we actually belong in nature…not in front of a screen or behind a steering wheel. 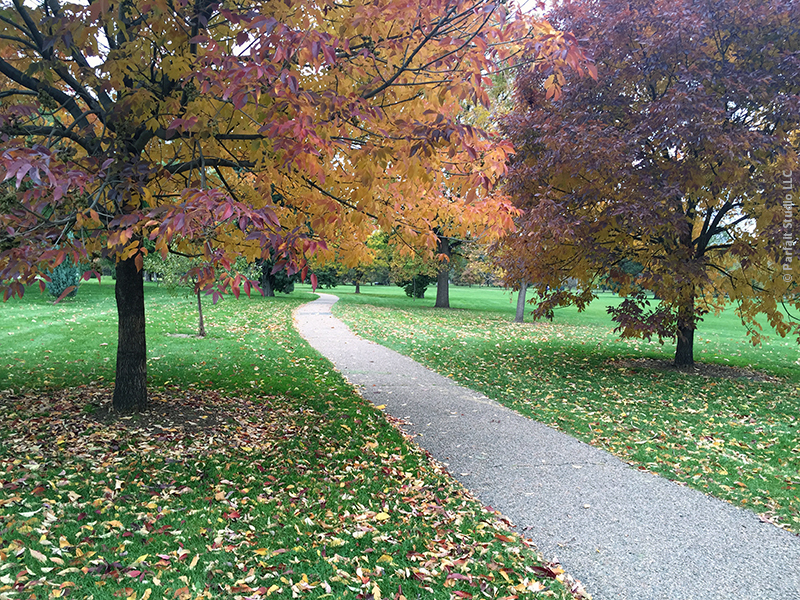 Strolling through autumn leaves in an urban park can be equally inspiring…and significantly crunchier. ~ Spend at least half of the time clearing your mind, focusing on your breath, and staying present to your surroundings. Gently turn away the distracting thoughts, worries, and recent conversations that want to creep into your conscious mind. If this sounds a lot like yoga, you’re not far off: walking meditation is a remarkable stress reducer. ~ Enjoy the environment and let yourself reconnect with the outside world…everything from trees and lampposts to birds and insects. It may seem a bit “woo-woo,” but I can guarantee that — once you find it — this sense of well-being has a way of seeping into everything you encounter after your walk. ~ At about the halfway point, maintain a mental buffer against negative thoughts, and allow positive ones to seep into your consciousness. This takes a bit of practice, so don’t be discouraged if worrisome issues keep inching their way to the forefront. Push them gently to the back burner and start fresh. ~ Letting your mind rest without pressuring it to fix everything is a great way to passively troubleshoot and resolve nagging problems, minor/major conflicts, or a project that’s stuck in the mud. Don’t actively summon these issues…let them float into your head at random and then consider them with patience and curiosity. You’ll be amazed at the solutions that pop up when you’re least expecting them. ~ Finally, when your walk is winding down, create a short mental list of the things you’ll tackle once you’re back home or in your office (make it doable…don’t overbook), putting the items that require the most focus and creativity at the top of the list. This way you’ll make wise use of the energy and endorphins you’ve built up during your walk. ~ Memorize the action list, then let it dissolve for the last stretch of your walk (write it down once you’re back in your workspace). Breathe deeply, look around you, and remember how good it is to be alive and able to place one foot in front of the other. Still not convinced that walking is a phenomenal mood lifter and productivity booster? Next time you’re feeling cranky or unmotivated, take a quick trip around the block and see if it helps you unblock. I’m headed outside myself…there are autumn leaves to crunch through, and plenty of projects that could benefit from a few extra brain cells! What an awesome post, Robin! I love to walk, but haven’t done it as much as I should in the past couple of years. I’m always in the “I don’t have time” mindset. But I’ve recently started taking hour-long lunchbreaks instead of thirty minutes to–guess what?–give my brain a rest. I should go walking for that last thirty minutes. I’d get my exercise in and be fresher when I come back to work! That sounds like a perfect plan, Nichole! I can just about promise you that the active part of your lunch hour will be thirty minutes well spent…plus, you’ll be much more motivated about getting back to work when you return. 🙂 Keep me posted!